The hospital was built next to the church built in honour of St. John the Baptist, and in its various rooms was collected together an enormous multitude of sick people. They were tended and restored to health daily at very great expense. 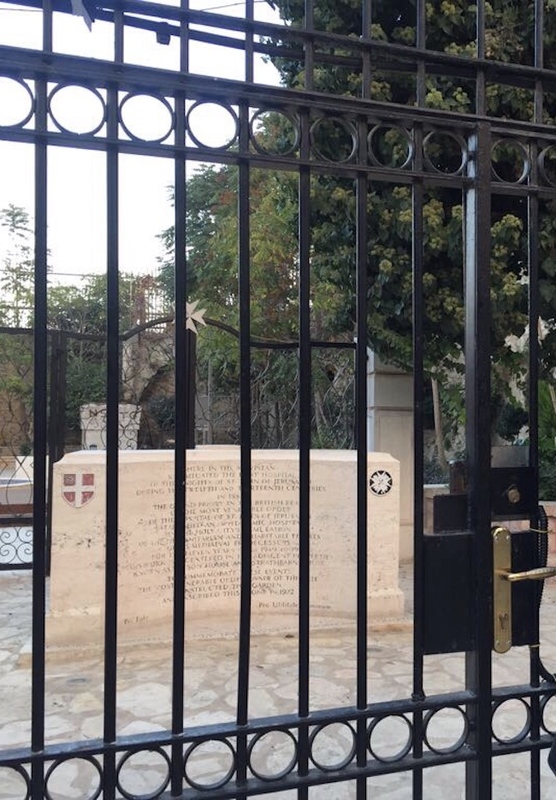 The same house supped as many people outside it with victuals as it did those inside, in addition to the boundless charity that it daily bestowed upon poor people who begged their bread from door to door. In addition to all these moneys expended, there were also the ones used to maintain many persons trained to all kinds of military exercises for the defence of the land of the Christians against the invasion of the Saracens. 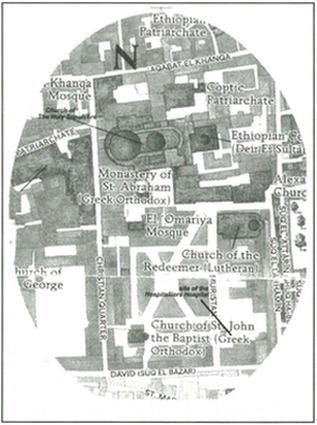 The various old descriptions of the site placed the Hospital of the Order of St. John in Jerusalem in the vicinity of the Church of the Holy Sepulchre and in close vicinity to the Lutheran Church of the Redeemer. The area was known as the Muristan. 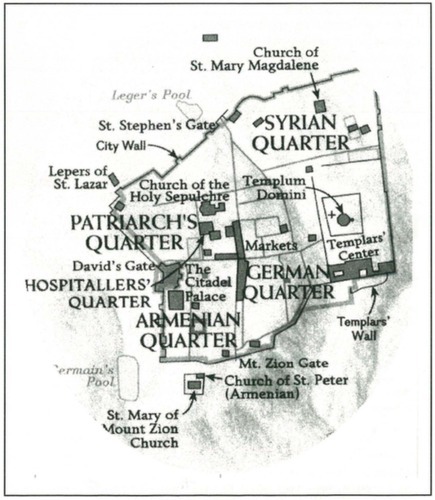 The modern map of Jerusalem helps to localise the three landmarks - Church of the Holy Sepulchre, the Lutheran Church of the Redeemer and the Muristan- in the Christian Quarter, in the centre of the Old Jerusalem. "HERE IN THE MURISTAN/ WAS SITUATED THE FIRST HOSPITAL/ OF THE KNIGHTS OF ST.JOHN OF JERUSALEM/ DURING THE TWELFTH AND THIRTEENTH CENTURIES. 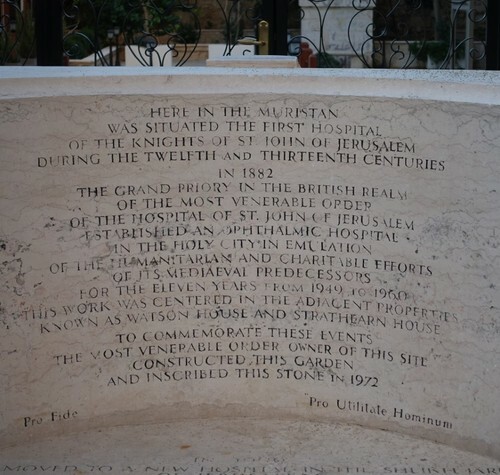 IN 1882, / THE GRAND PRIORY IN THE BRITISH REALM / OF THE MOST VENERABLE ORDER / OF THE HOSPITAL OF ST. JOHN OF JERUSALEM / ESTABLISHED AN OPHTHALMIC HOSPITAL. / IN THE HOLY CITY IN EMULATION / OF THE HUMANITARIAN AND CHARITABLE EFFORTS / OF ITS MEDIEVAL PREDECESSORS / FOR THE ELEVEN YEARS FROM 1949 TO 1960 / THIS WORK WAS CENTERED IN THE ADJACENT PROPERTIES / KNOWN AS WATSON HOUSE AND STRATHEARN HOUSE. 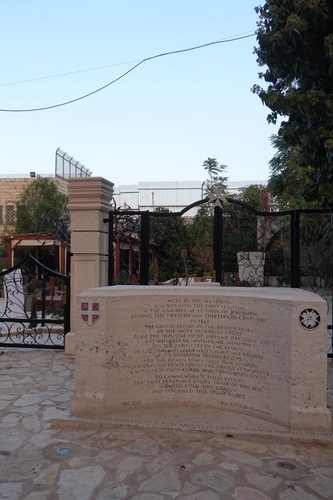 TO COMMEMORATE THESE EVENTS / THE MOST VENERABLE ORDER OWNER OF THIS SITE / CONSTRUCTED THIS GARDEN / AND INSCRIBED THIS STONE IN 1972." 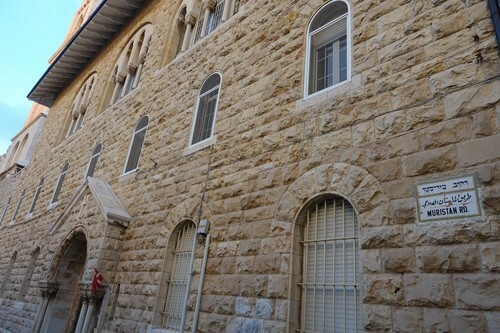 "IN 1900 THE WORK WAS MOVED TO A NEW HOSPITAL IN THE SHLIKH JARRAH QUARTER / OF JERUSALEM"
No remains, which could possibly belong to the old hospital, are visible from the road. 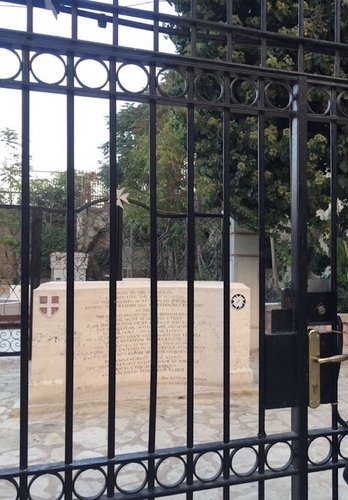 A doorway close to the memorial leads to a yard that was used as a schoolyard. Charles Savona-Ventura, " The first hospital of the Order of St. John of Jerusalem", It-Tabib tal-Familja, Issue 17, December 1999, pp. 17-21. 1. Charles Savona-Ventura, 1999, p. 17. 2. Charles Savona-Ventura, 1999, p. 17. 3. Charles Savona-Ventura, 1999, p. 21. 4. Charles Savona-Ventura, 1999, p. 17. 5. Charles Savona-Ventura, 1999, p.20.